Are you looking to buy a new high chair for your baby? We have reviewed some of the best selling high chairs from classic, convertible, foldable to stylish for your apartment. Quicklinks: Exactly what kind of high chair are you looking for? Why buy a high chair? 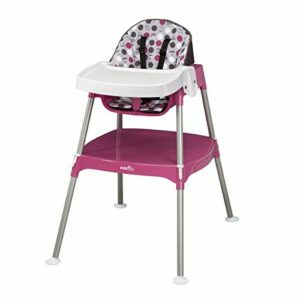 This Evenflo high chair is a great value high chair that is durable and convenient. It features up to three seating positions, and it grows with your baby to the stage of independent feeding. Moreover, this chair is stacked to form a full-size chair that offers a convenient height for interactive feeding. Evenflo high chair can also be placed on the floor, which gives your baby an option of placing their feet on the floor creating a discretionary seating environment for your toddler. As the baby transitions to independent feeding, Evenflo convertible high chair provides a convenient environment for an infant to play and dine freely. Additionally, the Evenflow high chairs construction is colored plastic and can support kids up to 40lbs. Prepare your toddler for independent playing and dining with Evenflo convertible High chair. Featuring three seating positions, it encourages your child’s burgeoning freedom, and it transitions them from initial high chair to a table and chair set. The Abiie beyond Wooden High Chair is a perfect adjustable baby chair for your kids and toddlers. Moreover, it is the best high chair of this review guide. (Unfortunately, this is also reflected in the price) But this should not deter you from checking it out. In addition to meeting your kid’s growing needs, it can grow them to their adulthood since you can transition it easily into a seat whenever you have guests. The Abiie Beyond Wooden High Chair comes with a dual restraint system that will allow you to secure your child well. It has the option of using a five-point harness for smaller babies or a three-point harness for toddlers. In addition to cushions being waterproof and resistant to stains, the tray is dishwasher safe and removable, which makes cleaning a breeze. Importantly, this valuable high chair has a three years manufacturer’s warranty. More cumbersome to move since it has no wheels. This kid’s high chair is suitable for busy families because it can serve as both a portable booster and featured high chair. It is packed with features and specifications that you will fall for when looking out for a portable high chair for your child. 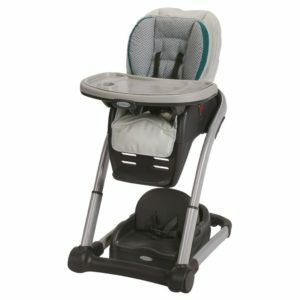 Indeed, Graco Simple switch Portable High Chair will boost your baby because it will give them a chance to join the rest of the family. This high chair grows with your child so that you can enjoy a lasting use. It comprises of three reclining positions to keep you younger one comfortable when eating. The conversion to the booster is quite easy as the built-in leg storage provides an additional convenience when eating sessions are over. Cleaning is easy and quick, thanks to a machine washable seat pad. Moreover, its one-hand tray removal makes getting your younger one in and out artless. Evidently, this baby high chair is convenient for taking your kid to the dinner table alongside other family members. The three reclining positions allow you to find suitable feeding position for your child. Cleaning the seating pad is easy. Being machine washable, you can toss in the machine, and in no time your kids will have a place to enjoy their mealtime. It is a 2-in-1 high chair, and it can be used as a booster as well. With the three and five harness, you will rest assured of your baby’s safety as they are firmly and securely held in the seat, with no chance of falling off. Assembling it is simple and requires no additional tools to put together. It is quite hard to remove the lower part of the detachable cover since the elastic loops holding it has to be stretched since they are small. 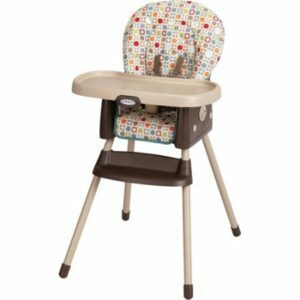 Graco Blossom 4 in 1 Convertible High Chair is one of the best portable high chairs that you should consider acquiring for your younger one. It has played a crucial role in the transformation of high chair family. It is particularly designed to grow with your child through their childhood, which makes it the best choice for a convertible high chair. In addition to 6 height positions and three recline levels, it has two seats. One hand removal tray further makes it simple to put your kid in and out. It is also worth noting that this high chair has baby head and body support as well as front wheels and locking rears, which make it an ideal candidate for your high chair acquisition. Having a machine-washable seat pad makes its cleaning easy. The three recline levels and six height positions make this high chair convenient for the baby because you can adjust it to a suitable position for your infant. It is quite pricey as compared to other similar options, but it is worth each dollar. 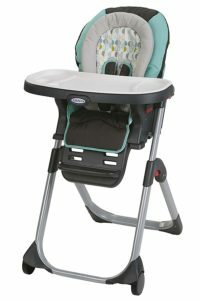 Graco DuoDiner LX Baby High Chair is a 3 in one high chair that can be adjusted to meet your infant’s changing needs. Branded Graco DuoDiner LX 3-in-1 Highchair, it can be used as a high reclining chair for a tiny baby, a normal feeding chair for a toddler, and as a booster seat when your baby can sit at the dining table. Additionally, this highchair is durable due to its nylon coated metal masterpiece and is particularly designed to meet your baby’s comfort and safety, thus making it very supportive and stable. Other parents have appreciated its top-notch features, which comprise of the single-handed back, easy to clean fabric and one-handed tray removal. 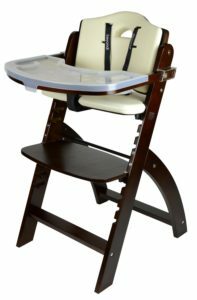 The back of the highchair has three recline positions at a handle press, which provides a superior support level as well as positioning your kid for perfect feeding. The footrest and height of the seat can be lowered or raised by a button push. Versatile design- The Graco DuoDiner LX Highchair will meet your infant’s needs during mealtimes, regardless of whether they are a young child, toddler or a newborn. It is very comfortable- with a soft fabric padded seats, it gives your kid very pleasant mealtimes. Being very robust, it provides a secure and safe dining surrounding for your child as it can neither wobble nor tip during use. It is portable and easy to store-to fold it, you simply remove the tray and seat and then fold the legs. This makes it convenient to transport as well as compact storage. Quite easy to assemble- it takes less than 15 minutes and needs no tools to complete the task. It is easy to clean- you can simply wipe the highchair down with a damp cloth. The seat pad, on the other hand, can be detached, and machine washed. Moreover, the tray can be lifted out and washed in a dishwasher. The rare casters are made of tough plastic, which could scratch your tiles or wooden floor. To avoid this, lift it rather than simply pushing it when moving it. The Graco DuoDiner XL is fairly heavy- at about 30 lbs, it is quite difficult to move it should you need to. With its large tray, it is hard to fit it in a small dishwasher. It has a built-in bottle/cup holder. The comfortable lap belt ensures that your infant is held securely in the highchair. The vinyl tray cover eases its cleaning whenever your kid messes it during mealtimes. The built-in cup holders cannot hold cups with handles. 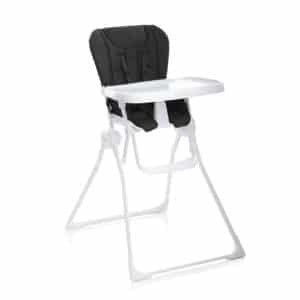 Joovy Nook highchair is an outstanding choice due to its ease of use. In fact, feeding chair trays are hard to use when one has either food or an infant in their hands, and the Nook highchair has an open tray that eases the difficulty. The large swing-open trays can be operated with one hand. Thus there is no need to detach the dish before taking your baby in or out. In addition to harness and seat belt to guarantee safety, this highchair is easy to fold. It is highly portable, and you can easily toss in the car or store it out of sight. Moreover, its light weight makes it easy to use and friendly to those with tiny kitchen or dining area. You can also use it for years as its tray has four depth adjustments to meet your child’s changing needs as they grow. Its seat has comfortable, full-sized and roomy padded seats. The leatherette seat pad is easy to clean. Another feature that makes it a highchair candidate is that it is ready to use right out of the box. Therefore, there is no unwrapping an assembling it. This chair blows away the competition of cleaning since has no crevices that could trap food, not base for food landing and no cushion to blemish. 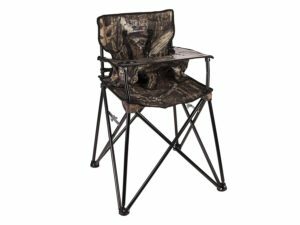 It has an adjustable five-point harness and can accommodate up to 50 lbs. It is compact and has a standing fold with carrying handle. Although it can look snug, you can seat a three-year kid with 30 lbs and about 38 inches tall. 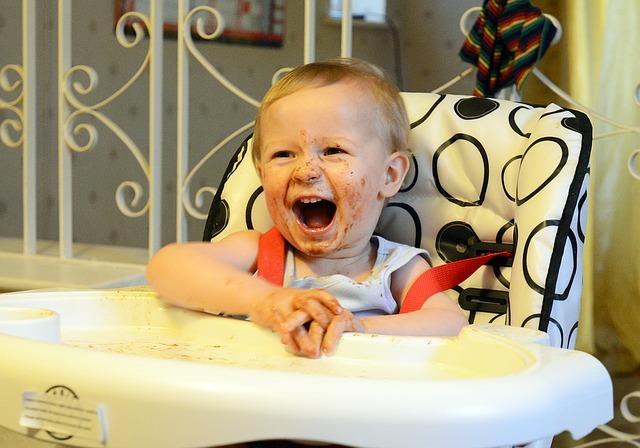 There is something common with those adorable baby pictures with chubby chicks and veggies and mashed fruit splashed all over their faces, and that is a high chair. When you commence solid foods, it is important to have a spot for your kid to snack in, which is easy to clean and safe. You could be wondering whether you really need high chair. However, if you choose not to buy a one, you can use a stroller, lap or other baby gear piece with a seat. Nonetheless, you should be prepared for the huge mess made all over that baby gear. We strongly urge you to have a high chair on your registry since it is not only easy to clean, but also convenient and will offer an upright positioning for your kid, depending on their age. Your feeding chair choice depends on where you feed your baby more often, the level of daily cleaning you are willing to do as well space in your dining area or kitchen. There is standalone, larger feeding chair that you can have around your table or anywhere in your home, which comes with their own tray. You can get a cheap and basic plastic model that is easier to clean or opt for one with more whistles and bells, wheels, convertible seat, wipeable cushions, footrests and a chair that is adjustable to different heights. If you have limited space, you could consider a full-size high chair that is convertible or can be folded and can be stored when not needed. Alternatively, you might consider a portable high chair that can be attached to one of the dining or kitchen chairs or your table edges, which is a great option for those who eat out often. Additionally, there are affordable high chairs that grow with your kid by transforming to a booster seat for kids and toddler-sized chair later. A highchair with a crotch post is recommendable as it prevents the child from slipping and falling off under the tray. Majority of highchairs have it attached to the bottom of the seat while others have it fond of the tray. Always look out for a seat whose height can be adjusted by moving it up and down. Majority of the high chairs has pneumatic poles that ease its adjustment to various height positions. Adjustable highchairs make mealtimes easy since you can adjust the baby’s height to your level. Moreover, look out for chairs that can be reclined as it is suitable for children who would like to fall asleep after feeding. A high chair should have at least three-point harness. The harness should be adjustable to accommodate various child sizes and should be easy to use as well. While the buckle of the restraint system should withstand wiggling child, it should be effortlessly operated by a grown-up. Highchair models with removable covers is recommended as it is easy to clean. High chair foldability is essential as it makes it easy to transport as well as storing them. But it should have an efficient and secure latching system so as the chair does not folding while you have your baby on it. A high chair tray should have position adjustments. This eases moving it closer or farther to the kid, thus makes feeding more comfortable. Furthermore, the tray should be easy to attach or remove to the high chair. In fact, some chairs have trays that can be retorted on or off to ease cleanup. If you need your high chair to be multi-purpose, be sure to consider a convertible high chair. If you can use it as a booster when your baby is grown, then you will enjoy a couple of years’ worth of usage from your purchase. Indeed, durability is a huge deal. This chair is going to be used every day for up to three years, and therefore the high chair should withstand heavy usage. You would rather spend more money on a high chair and be sure that you can even use it for your second child. A grown-up should easily operate the harness fastener. However, it should be difficult for the child to operate. Though three-point harness faster is recommended, five-point harness fastener is better because they are safer. It prevents your child from leaning or standing over, which may lead to falls. Be sure that the chair is very stable. Make sure it does not tip over when your child wriggles on it. Use high chairs on level grounds to minimize the risk of falling accidents. Your child can easily tip over when placed on an uneven surface, especially when they wiggle. Always have an adult supervise your child when they are sited on a high chair. This is just a precaution since accidents can occur even when restrained. Read this article by Cleveland Clinic if you want to know more about child safety in a high chair. When the portable high chair hook on a table, ensure that the table is weighty enough to support your child without tipping over. Desist from placing a high chair with your child on it on a countertop or the table since they can easily fall. Ensure that the high chair is placed far from counters and tables in restraining your child from pushing themselves over the chair using their hands or legs. In conclusion, portable baby high chairs are expedient gears for all family types, regardless of whether you’re parent and would wish to travel with your kid or you’re a stay at home parent who wishes their child to sit on the dining table. Be sure that that you enjoy every bang of your buck when selecting a high chair for your baby. Additionally, if you are shopping for a modern high chair, you will want to opt for one with sleek lines and has the outlook that you adore. However, you should opt for one with comfortable specifications so your baby will not hurt at the expense of your love for modern design. I would endorse that you choose Abiie beyond Wooden High Chair with Tray because it is the best baby portable high chair. Although it is slightly expensive, it is the best overall and is worth the price.